Thank you to our valued clients for your ongoing support over the past twelve months. We look forward to another exciting year ahead. Dr George Jacobs and his wife Janice were very fortunate to travel to India last December, where they had the opportunity to see old-style farming in tribal villages in the Western Ghats in Southern India. The villagers still use Zebu cattle to pull the ploughs and till the soil. Photographs of these cattle can be viewed on our website www.mogulstud.com.au through the home page link to Indian cattle. On the home front, we were delighted by our most successful Rockhampton Brahman Week Sale results in October 2003. We sold five bulls for an average of $8,600, with the top price being $16,000 for Mogul Nike. At the 2004 Sydney Royal Easter Show our dominance of the performance classes continued, with Mogul Oakwood and Mogul Patriot Manso winning the two classes. 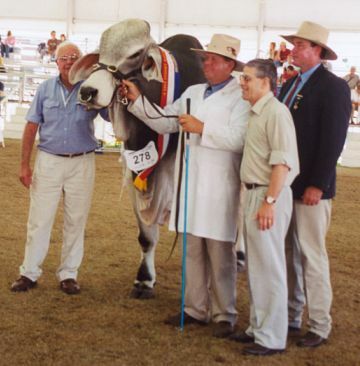 Mogul Oakwood, weighing 1118kg at 35 months, won the Senior and Grand Champion Brahman Bull awards. Mogul Stud Manager, Glen Pfeffer, collected the best individual Brahman herdsman award for the 19th time and was placed third overall in the entire beef section. In the Hordern Trophy, Brahmans were included in the final line up of five breeds. Mogul Oakwood and Bizzy Chrissie formed the team for this interbreed Champion of Champions pair competition. Congratulations to the Western Group for their successful staging of feature shows at Warialda and Guyra. We were delighted to be there, and take home several trophies. Glen Pfeffer was given the honour of judging the 2004 Queensland Brahman Feature Show, which was held at Longreach. The response to our participation in “The Land” inaugural Northern Beef Week Open Day program in June 2004 was extremely gratifying. It is good to see new initiatives such as these making an impact. The interest generated by the arrival of our first calves by Mr Fontenot 125 (Imp.) has been very pleasing. These red calves are very stylish and developing rapidly. Photographs of some of these calves were contained in our advertisement in the March 2004 “Brahman News” and may also be viewed on our website. Our former show champion Mogul Maseratti has produced an impressive, balanced line of red bulls and females. JJ Cuatro Didor 919 (Imp.) has produced grey calves showing excellent carcase attributes combined with strong Brahman character. For the current season we have introduced the new sires Lancefield D Kayle Manso and Kenrol Montana. Both of these have full Hudgins breeding. We have an excellent range of cattle available for your inspection on property this year. Sires represented include Apis Creek Brayson, Glengarry Reno, Jay-W Sir Bruce, Jay-W Dos Press Junior, Mogul Kama and Mogul Maseratti. Mogul Performance Brahmans are committed to adding value for our clients by utilising technological innovations such as Breedplan and Genestar tenderness testing. See our website at www.mogulstud.com.au for more details.